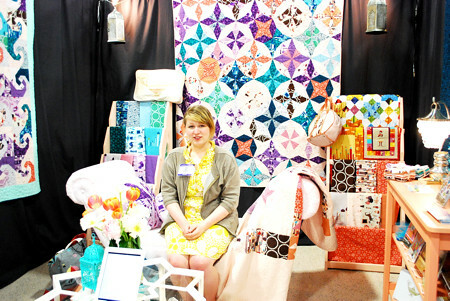 Spring Quilt Market 2011 (re-cap 3) - Stop staring and start sewing! Sorry for the absence. 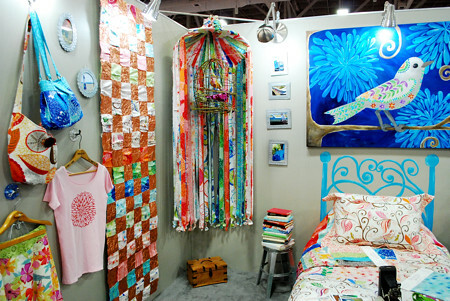 Quilt Market is one of those events where recovering from it takes longer than the event itself. There are parties every night and that's after a long day slogging ever-growing tote bags all over the convention center. 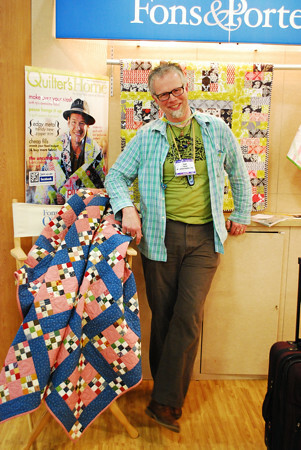 If you ever want to see a gaggle of strung out quilter, well this is the place. Bliss. 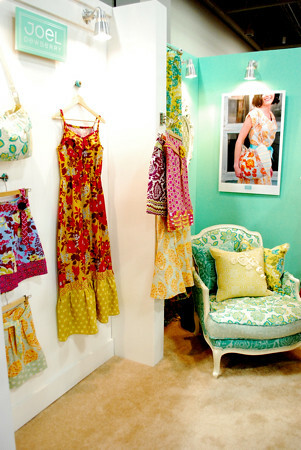 Today I'll focus on the designers over at Free Spirit. 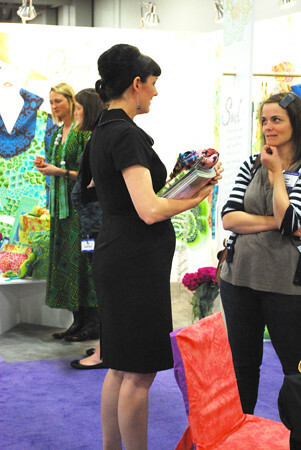 They have such wonderful fabrics and even more wonderful designers so everyone loves seeing what they're all up to. 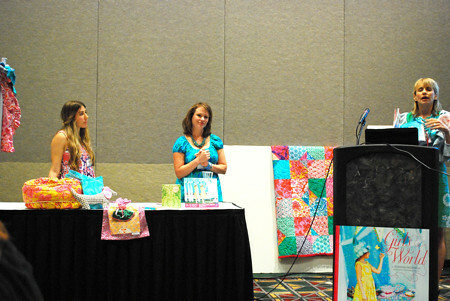 Here is Jennifer Paganelli's schoolhouse presentation and it was informative, fun, and most of all, colorful! Jennifer has a beautiful new book out called Girls World and you want it. 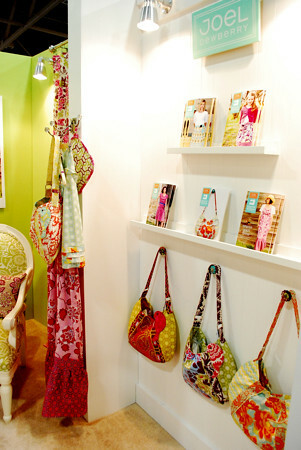 You also want her new journals and notecards. One the left is Jennifer's assistant Madeline who is so sweet and has a great sense of humor. 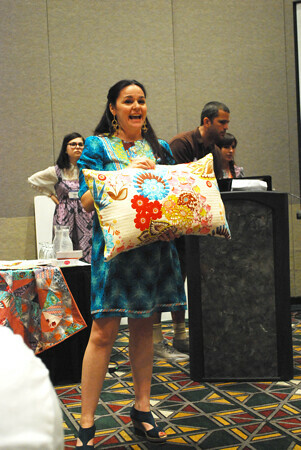 In the middle is Carla Crim the Scientific Seamstress and she is such a hoot. Her patterns are without compare and, in my opinion, she is the Queen of the ePattern. 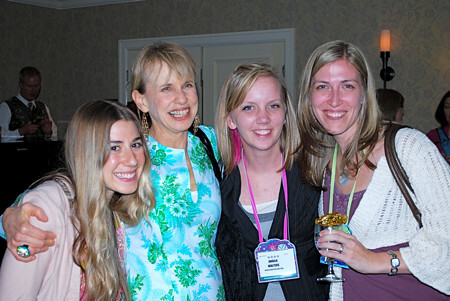 Here are Madeline, Jennifer, Angela Walters, and Jessica Levitt at a social event hosted by the gals from the Portland Modern Quilt Guild. 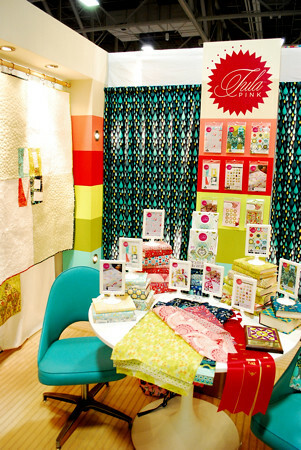 If you are unfamiliar with Angela please spend some time at her blog because she is the quilter behind Tula Pink's (and many others) amazing quilts (and she's writing a book!). Here is Jennifer doing a book signing. I'm an idiot and waited to long to get mine (didn't want to load my tote down early in the day). But, mark my word, it will be mine. 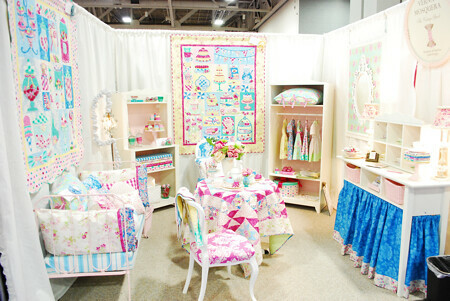 Tula Pink's booths are consistently awesome. 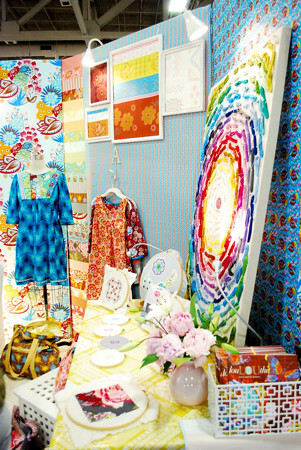 Oh, her fabrics are too (but you knew that). 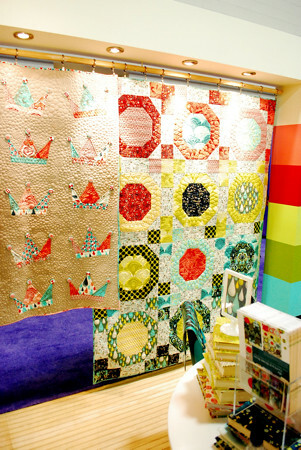 I really love this crown quilt (Angela's quilting work on display again)! Here she is doing an interview. Glowing. 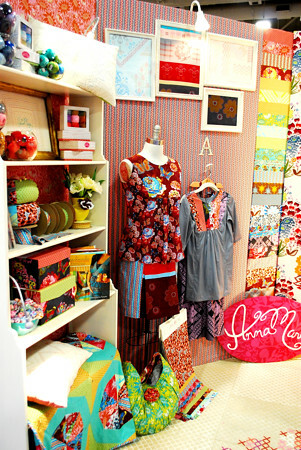 Check out her paperwares here and the new book she's in here. 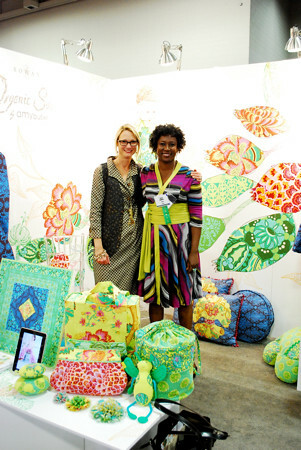 Her new fabric line is called Garden District and will be all over the place soon. As usual, Anna Maria Horner had a million things going on and she could've used a 2 hour schoolhouse session to explain it (although she stuffed a lot into her allotted 30 minutes!). 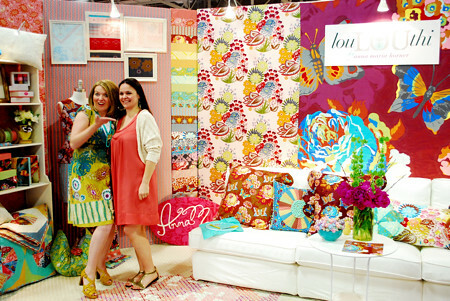 Here is her gorgeous double booth (being interviewed by Daria of Boutique Cafe). Lots of new threads, accessories and some new patterns coming. Center booth picture of her soothing couch with stunning pillows. Some incredible stitchery items to be release very soon. 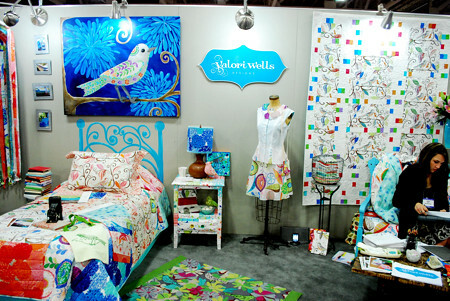 Valori Wells had a great booth with glorious colors and don't you love that painted-on-the-wall headboard? 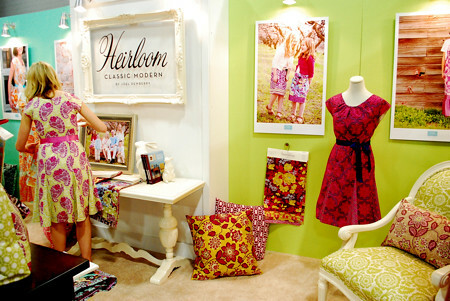 Joel Dewberry is back with a collection called Heirloom. It's receiving raves from everyone as did his booth. His wife has been working with him on developing some lovely patterns. Really cute stuff. Love the colors all together! 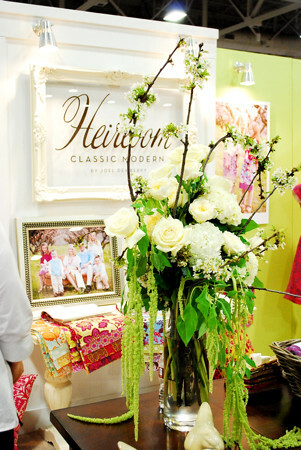 Verna Mosquera had the sweetest booth and her new fabric collection is simply beautiful, flowery, and feminine. Swoon. 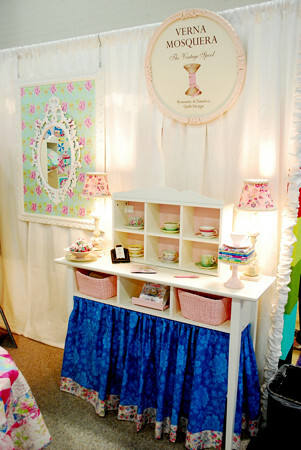 She had the neatest lighting in her booth including this awesome little chandelier. 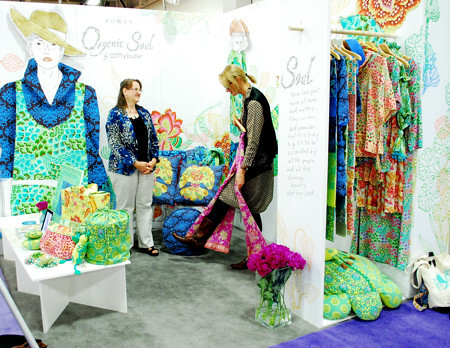 Amy Butler has a beautiful new organic collection. 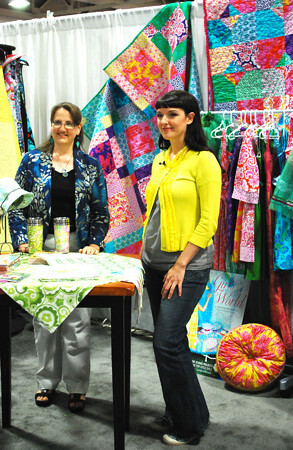 Here is Amy with Tricia Waddell from Stitch magazine. 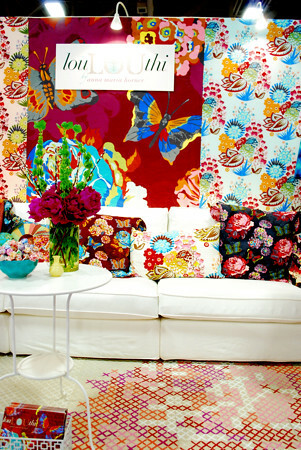 I love Stitch magazine! Another beautiful quilt. 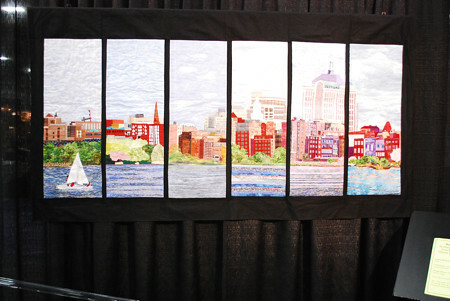 This is Boston's Back Bay by Mary Lou Schwin, Janet Dye, Joan Randall, Janet Duncan Dignan, Patricia Smith, Graciela Piccolo. Wow. 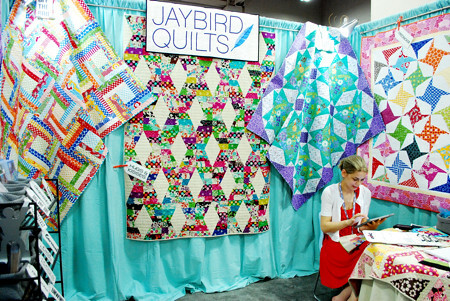 Here is Julie of Jaybird Quilts. Julie is incredibly talented and a really fun gal to boot. 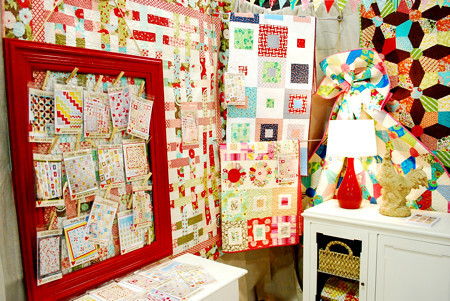 I love this quilt on the left with the ribbon-y look. Here is Lizzy House debuting her 1001 Peeps collection. 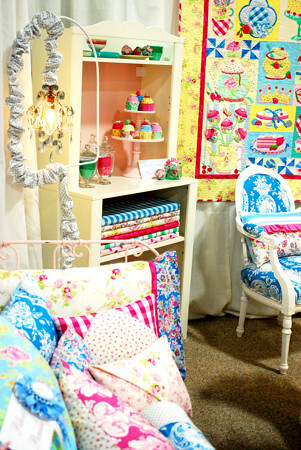 Gorgeous booth and a really neat couch (couches are a good idea, standing gets old). This is Allison from Cluck, Cluck, Sew. It was a joy to meet her in person and she's super nice (I kind figured!). 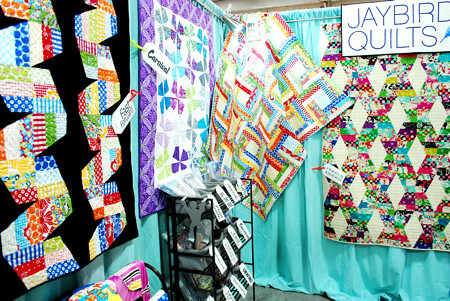 Gorgeous quilt and patterns worth having! And here is my pal Scott Hansen from Blue Nickel Studios. 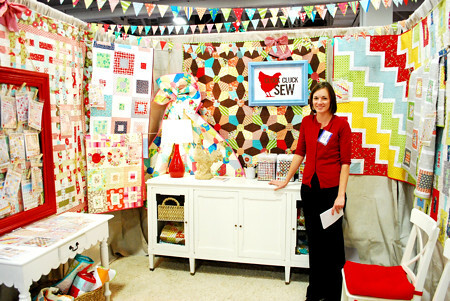 Scott created the quilt that Ty Pennington is wearing on that magazine cover there (as seen on Jimmy Kimmel too!). He's got some more exciting things in the works but you'll have to watch his blog to find out. 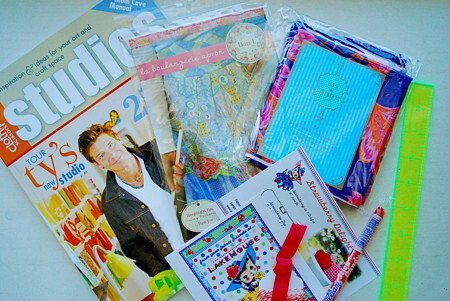 And since I don't have a magazine with Scott on the cover you'll have to settle for Ty Pennington (sorry!). Today's give away is this Studios magazine (I already have this one and it awesome because Bari J. is in it too! ), Bari's new apron pattern, 2 luscious fat quarters from Jennifer Paganelli, this nifty 1" ruler, and more Pam Kitty treats! Just leave a comment! Have a wonderful weekend! Do something you've been inspired to do for awhile but haven't gotten around to (you'll be glad by Monday)! !